Still cranking out birthday cards! This wasn't made with any of my 500 (only slightly exaggerated!) Jan/Feb/Mar birthday people specifically in mind, but it may end up being used for one of them if I don't come up with something better. 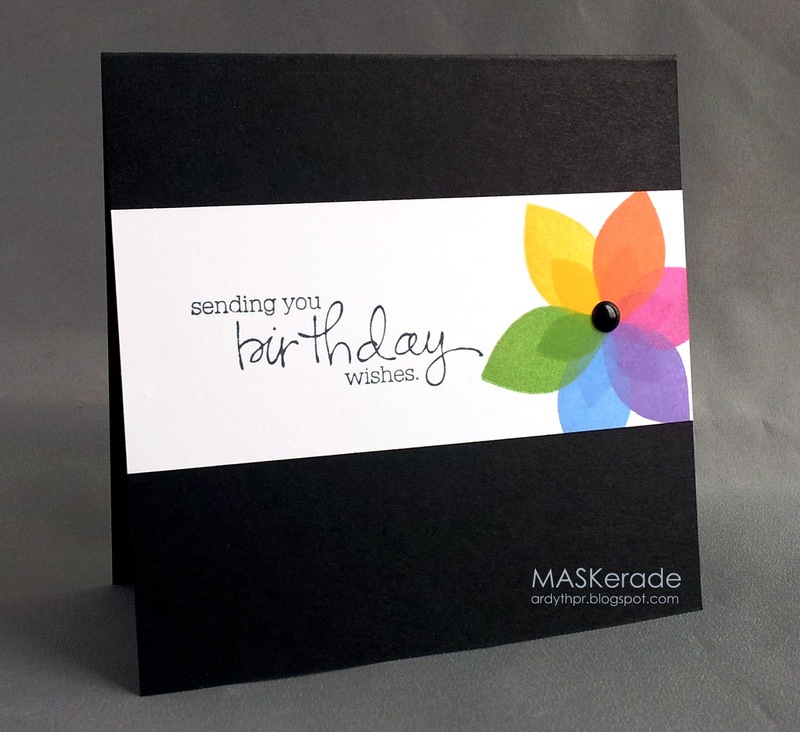 I love how the rainbow colours pop off the black and white, and I also love the intensity of the double-stamped inner petals - such an easy little trick to add a lot of depth and interest to flat stamping! I made this flower about 10 times, and trick really became cropping it properly, so it felt balanced and had enough of each colour but was still interesting. Michael's sentiment, Paper Smooches leaves used as petals. Its lovely, I am a sucker for bright colors. Probably why I am drawn to your blog over and over again. Fantastic set off with the black. Love all things rainbow .... and this is perfect! I love how you stretch your stamps...this is gorgeous Ardyth! Gorgeous Ardyth - love the huge pop of colour against the black and white! This is such an amazing rainbow card, I will be CASEing you tonight! 8 times? I would have given up after 3, or said "Good enough" and went with what I had. You have such patience and a good eye. Gorgeous card and awesome Michael's sentiment! I'm glad to hear that I'm not the only one that 'practices' stamping and re-stamping....over and over....to get it right! Perseverance paid off, because this is another stunning creation Ardyth! Gosh, Ardyth--this one has your name all over it. Lovely placement, color choices and design. It's amazing how cropping the flower adds so much to the design! Fabulous. And I love the handwritten font on that sentiment. Your leaves turned into flower petals are so pretty. The rainbow colors really pop against the black and white.